The Oakland Raiders will host the Carolina Panthers in what looks to be one of the most interesting games of week 12 in the NFL. The Raiders will have back to back games at home and with this they hope to solidify their AFC West lead, momentum seems to be on their side as they are on a 4-game winning streak. The Carolina Panthers on the other hand are seeing their possibilities of an off-season appearance slowly disappear, they are currently in 4th place in the NFC South with a 4-6 record. Cam Newton and his crew are aware of their predicament and will try their best to win as many contents as they can while hoping that the Atlanta Falcons will slip at least one before they play Carolina later this season. There are still 5 more weeks in the season and nothing is over until it is, the Panthers won their last contest at home against the New Orleans Saints, which I realize is not a great feat but a win is a win and every single one counts. This week’s game is scheduled to start at 4:35 pm on Sunday at Oakland-Alameda County Coliseum and will be broadcast by CBS. This will be the last game of the regular season where the Raiders will face an NFC team. Last week the Raiders traveled to Mexico City for the first ever Monday Night Game played outside of the US, they defeated the Houston Texans in that bout, however there were some questionable calls in that game that have a lot of people debating the merits of the win. That win puts them in par with the New England Patriots, both teams have an 8-2 record however, Oakland is ahead due to a stronger winning percentage in common games. This week’s game against Carolina will present challenges for the Raiders, who’s offense struggled against the Texans despite the incredible rally in the 4th quarter that gave them the win. Oakland’s defense were expecting to have a tough match against the multi-faceted Cam Newton but they might be catching a break this week. Carolina lost a lot of key players due to injury, including All-Pro linebacker and leader of the defensive lineup Luke Kuechly who suffered an awkward hit to his head and is now in the concussion recovery protocol program, and is not expected to play this week. Also, out due to injury are All-Pro center Ryan Kalil (shoulder injury) and defensive end Mario Addison (foot injury), Addison also happens to be the team’s lead sack. By contrast quarterback Derek Carr of the Oakland Raiders will have all his weapons at his disposal for Sunday’s game. Carr is having one hell of a good season with some impressive stats is on the short list for MVP this year, you can bet he will take every opportunity handed to him to improve his chances and those of his team to reach the post-season as the leaders in the AFC. 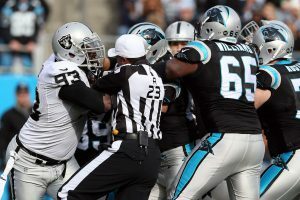 The Raiders are on a roll and while they don’t have the best home record (3-2) they will walk away with a win against the Panthers, not so much because of the home field advantage but because of the injuries on the Panthers team. Final score of the game should be 20-26 Raiders. Check out the latest NFL odds at www.AceSportsbook.com.